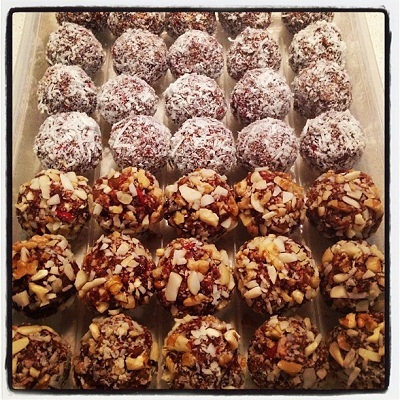 Try out these delicious bliss balls for your next snack! In a food processor blend the almonds till fine. Put in a bowl. Blend the pitted dates with cocoa, and vanilla until they form together, add a tiny bit of water to this if its too stiff while its blending. Add date mixture to the almonds. Chop the dried apricots into small pieces and add this to the bowl with the goji berries. Mix all the ingredients together with your hands until they are well combined. Note: you can also roll in mixed nuts (pictured as well, however the nutritional panel was calculated using coconut).